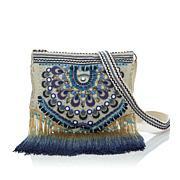 Infuse your outfits with a bohemian flair. 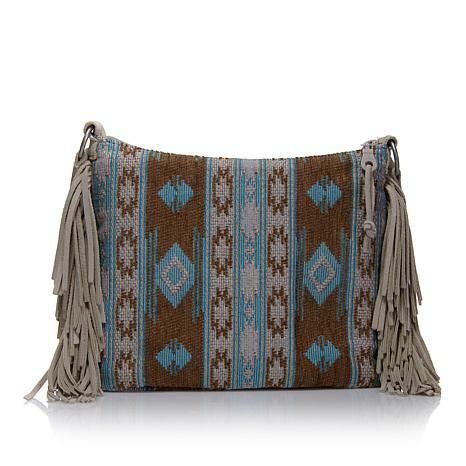 Genuine suede fringe and a native-print textile come together in an eclectic crossbody that's fun to wear. It's just the right size for your everyday travels. I have 7 Minnetonka suede bags I believe and love them all. Lighweight and stylish. So happy to get this tapestry one. I got the red. Beautiful. I received this bag and I decided it unusual! Not like any other bag I own. I ordered this for my spouse. 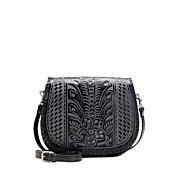 She says it is a little smaller than her normal size bag but that it is beautiful. She says he will use this when she needs to downsize before shopping. She said the quality is excellent.